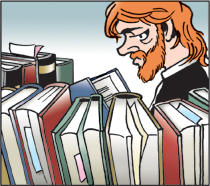 Welcome to the Doonesbury Say What? Archive. I'm not running for comedian-in-chief or entertainer-in-chief. I am not going to light my hair on fire and shoot sparks up my ears or whatever. It was a good program, it was a legal program, it was not torture. I worship the ground that Paul Ryan walks on. Knowing how Washington works isn't necessarily an advantage. As a businessman going in, I don't want to know how Washington works. I want to change Washington, D.C. and so by not knowing how it is supposed to work I can ask tough questions that will help change the culture. The literati sent out their minions to do their bidding...A lesser person could not have survived the first few minutes of the onslaught. But out of the billowing smoke and dust of tweets and trivia emerged Gingrich, once again ready to lead those who won't be intimidated by the political elite. The rapture definitely took place, but there just wasn't a soul worth saving so it went unnoticed. The world will still end in October, as planned. It has been a really tough weekend. I maintain the strong conviction that if I were to run, I would be able to win the primary and ultimately, the general election. If the world does end tomorrow, alternate side parking will be suspended. Amazingly, May 21, 2011 is the 17th day of the 2nd month of the biblical calendar of our day. Remember, the flood waters also began on the 17th day of the 2nd month, in the year 4990 B.C....This is going to happen. Millions will die. It's going to be horrible.